1. Heat tbsp of ghee in the deep bottom vessel or in the frying pan. 2. Put the sooji and roast it for a while it has to be hot enough if u touch it. And aroma will increase and upma will not be sticky too when u do this procedure. 3. In another deep frying pan heat the oil and season with mustard and dhal. 4. When it turns to golden brown add the onion, green chilli, ginger, vegetables. saute slightly. 5. Add the water and check for salt. 6. When water comes to boil add the lemon juice and put to low flame. 7. Add the roasted rawa to the boiling water by stirring continuously. Adding rawa and stirring water should be done simultaneously otherwise lumps will be formed. 8. Blend well and close with a lid for some time and mix it. 9. Let it rest for 3 to 4 minutes in the low flame then put off the flame. 10. Mix well and serve with mango pickle or whichever you like. It will be heavenly. 1. Add rawa to water only when water comes to nice boiling point otherwise upma will be sticky. 2. Saute veggies for 2 minutes or so only then the color and cruchiness of vegetable will be maintained. 3. Do not add too less oil then upma will be so dry or sticky. 4. Lemon can be added according to ur sourness level. 5. I usually add more dhal for seasoning so that we can feel the crunchiness in every spoon. My fave breakfast item-I used to hate it as a kid though!! 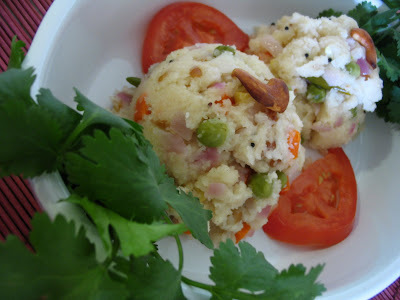 Lovely Upma! Our fav breakfast.......Quick and tasty dish! Our favourite breakfast...looks amazing Pavithra...am awestuck to see ur wonderful presentation each and every post!! !U r rocking! Love the look of the upma! Looks so delicious. Comforting food indded. My all time fav bfast..i like it without veggies..looks yummy.. Very nice presentation..Not just regular upma..its a cover page Upma for a Recipe book. this picture reminds me of m paati's upma! IT looks great..
As a kid i never like upma pavitra,but after marriage i had to make this now n then and now i started liking this upma...Even i hv this post pending in my drafts.. I always enjoy viviting your blog. You make food look so inviting. Luved the Upma. Looks colorful and healthy:). 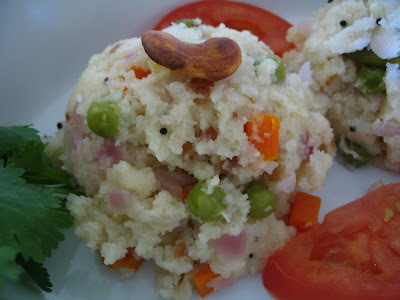 This upma s lovely...and as usual superb presentation..
Yummy upma..Love it pavithra..Handy breakfast..
Looks so delicious. Nice picture. Upma looks awesome...Looks like wonderful comfort food . Wow a saving breakfast.....looks yum....When you run out of batter this comes as rescue.....Nice presentation. I know many people don't like uppuma, but this is one of my favourites. And like you say, its one of the first things that comes to mind in an emergency. 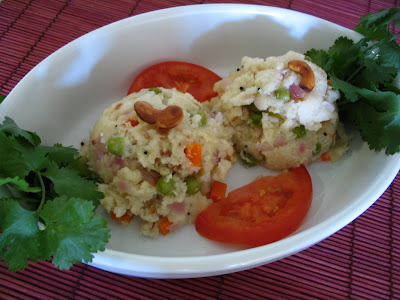 veggie upma is yummy.. wonderful easy meal.i like the tomato flavor too so i add that too . this is my favourite Pavithra......well ur pics top everything! !